I don't know the area too well but wouldn't an underground parking garage solve most problems? If I remember correctly, they have quite a lot of issues while constructing due to swampy undeground in the area. I don't know how that helps when you have to dig deep to build an underground parking garage. Maybe it's just not possible or way to expensive. And they also have the problem, that the big parkinglots are not owned by the park and the owner wanting a way to high price for them to sell them to the park. So there is no way to build underground parking lots on that space. 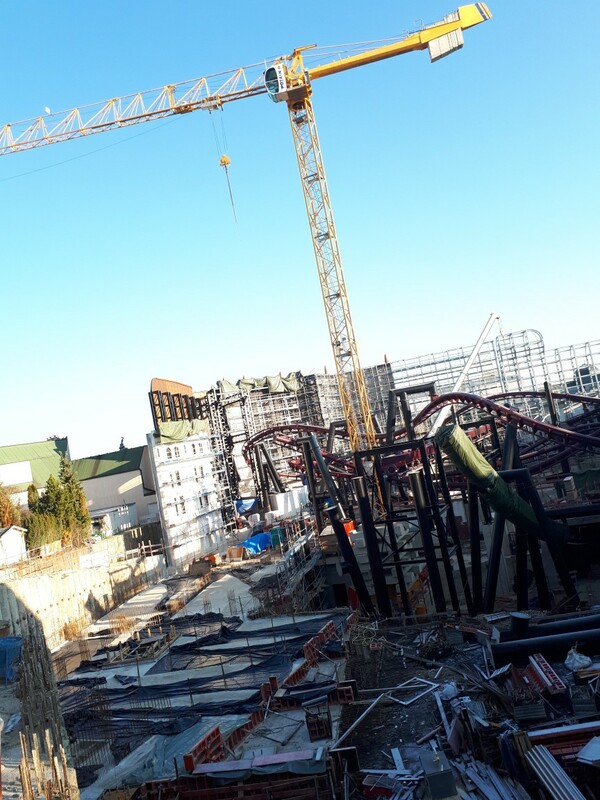 I am ging to phantasialand tomorrow and I suspect that once the park is closed (Sunday is the last day) in preparation for the new season they will pick up the pace. However winter weather might make things a bit complicated. Temperatures started to drop. Excited to see how it looks when the parks opens for the new season. EthanCoaster, Bonsai97, Steel & Story and 10 others like this. Yeah that ain't opening this year. Steel & Story, Stevie, tomahawk and 2 others like this. This is the same picture as weeks ago. Except for the snow. I know, it's a hard project etc. But this build is exceptional slow. But this build is exceptional slow. I just wish they had a schedule. Jaiden M., Steel & Story, Yoris Kerkhoff and 4 others like this. Also, I'd hate to think how much that tower crane has cost to hire thus far. CSLKennyNI and Brian like this. What you guys all see now, is what I tried to say months ago. But don't worry. We get a RMC in Walibi Holland. Which will have 5 inversions! The icing on the cake is 2020. The longest and worlds first Flying coaster with a lauch. I mean TWO launches! And that all packed in a world class themed area. Someone didn't pick up on Ethan's sarcasm. Jaiden M., Steel & Story, Yoris Kerkhoff and 6 others like this. Steel & Story, Arnd Francart, Jared and 2 others like this. I do wished that had planned this out better. Christ they should have hired Brian from the get go. Jared, Benenen, Pear and 1 other person like this. I don't know by the way. 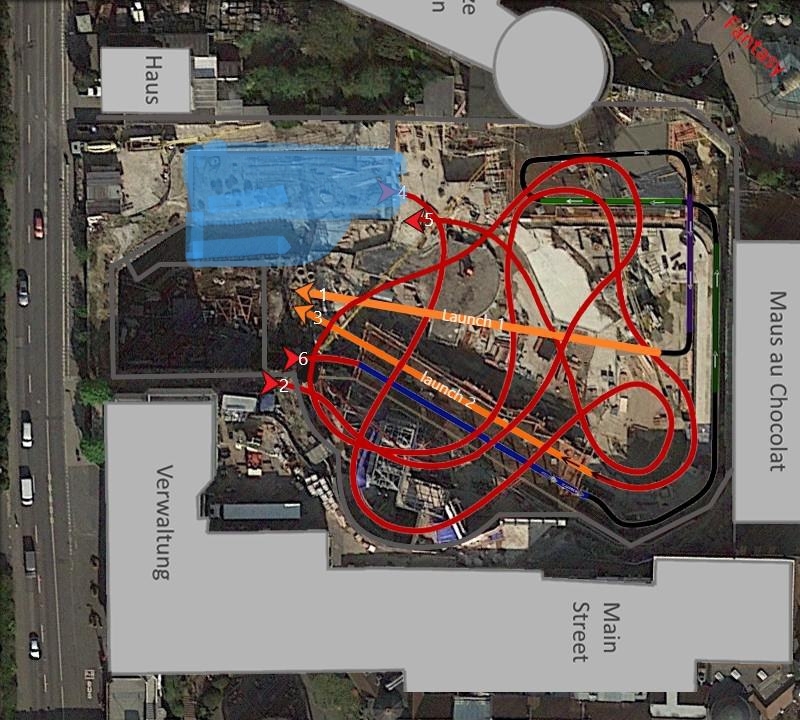 I think, that if all the track is placed by the end of february, we could still see a July/August opening. As I mentioned previously, I really do think that the themeing elements are more simple to place than they were for Klugheim (even though Rookburgh will be more immersive). For what we know it could be all pre-fab facades which can be placed overnight (figuratively). I see the hotel being finished not later than september (worst case), and what would they do? Leave it empty for 9 months? Open it in wintertraum, but leave the entirety of Rookburgh closed? Would they open Rookburgh durning Wintertraum, although that would be stupid? Keep in mind that it won't be a hotel like Matamba, and that it will take far less time to build. 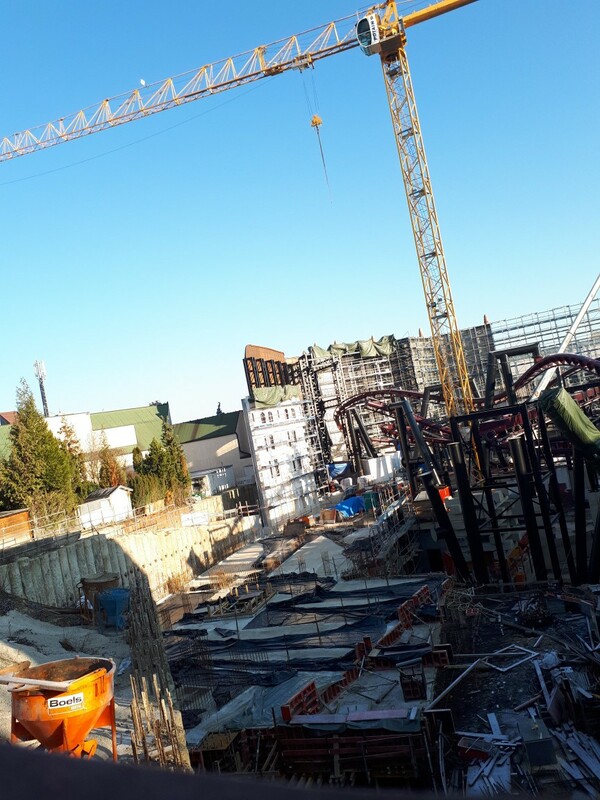 The only concern for a 2019 opening I really have is the lack of communication from Phantasialand, but here it could all have to do with licenses and stuff. Really? I can see plenty of changes since the last photo from before Christmas. Also worth keeping in mind its only been 2 weeks of work and during some rather freezing winter days. Most noticeably in the bottom left the concrete roof of/level above the maintenance bays building has been poured. As well as a section that connects it to higher level is being currently used for storage - it seems to also be forming an underground tunnel. Presumbly F.L.Y. might dive through there? I've marked the new concrete foundations in blue. In this are a number of coaster footers and various clusters and lines of rebar/foundations for buildings and structures - presumably buildings which will belong to the hotel complex. Also of interest in the middle an opening has been left for the trains to be delivered and lowered down into the maintenance bays. Directly in front of this I think they have started painting on the new themed façade. Difficult to tell with the light and shadows, but the bottom corner stones appear darker. However it does seem once they have finished painting and fitted the faux windows it will be done. On the back of the Wuze Wall works appears to be well underway with the first section (beside the black steel towers) already having its first layer of concrete applied. The rest of the wall has already been covered in scaffolding for the workers to apply the framework so theming here shouldn't take too long hopefully. 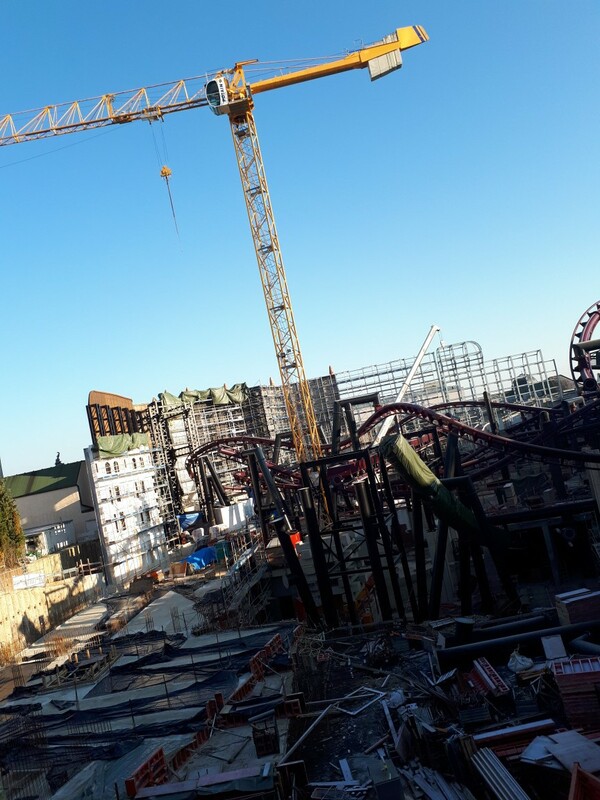 Completing what they were working on just before the holidays hey have now erected more the wall right up to Maus/4D Cinema corner (marked with a red line). Half way down this section of wall more metal framework has been added - presumably when themed it will create a 3D façade of buildings/houses. The top red arrow points to another new arch structure which the (?) S turn into the 2nd launch travels through. The lower down arrow points to some new large tarpaulins covering the opening to one of the underground spaces. Potentially theming related. Reminds of how they had tarps over the ends of the 2nd launch and brake run tunnels when they were theming the interior of them and the tarps over the top of the scaffolding on the facades currently being worked on. 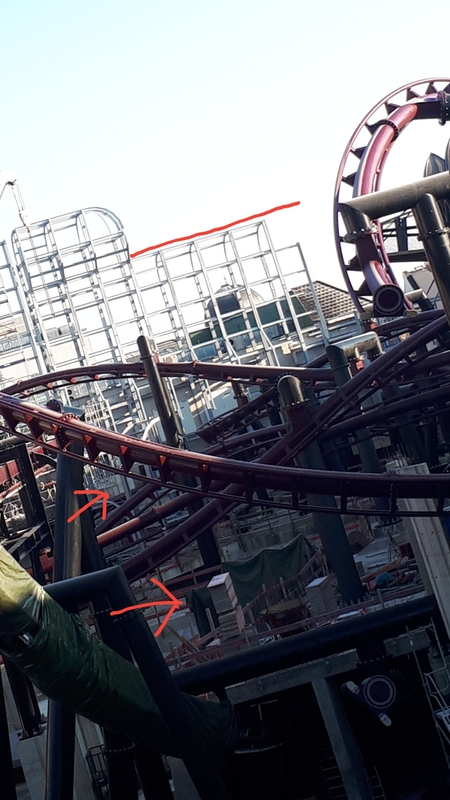 Also on the wider photo of the right hand side of the site I've noticed they have added more of those, previously discussed, cable ducts along the wall, now heading down into the brake and launch tunnels and are already wired up/carrying a number of cables. Still though I'm doubtful this year we will see an opening there's just so much theming work that still needs to be done. 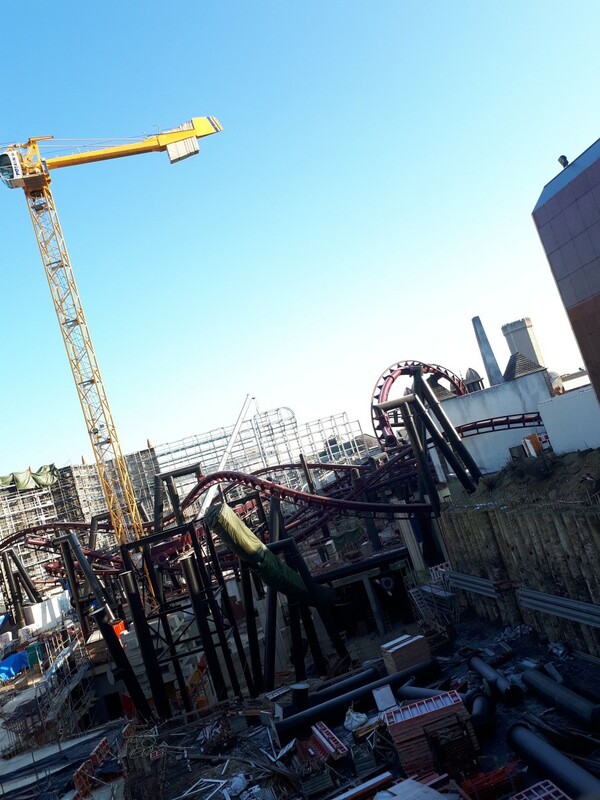 Although if they do manage to complete the area come Autumn/Winter I could maybe see them opening it then, rather than have a money making finished hotel sitting unused until April 2020. Will be interesting to see how things are come the start of the season on 1st April. There should certainly be more track in by then considering the newly completed footers or it may even be completed. Yoris Kerkhoff, Arnd Francart, peep and 5 others like this. Tobi has given us a small glimpse of his model of the new. gen Vekoma flyer. Zek_Teh_Kek, Coaster Hipster, Robert.W and 3 others like this. CoasterMac305, Howie, Serena and 6 others like this. Still not overly keen on the look of the trains to be honest. I do hope they get some interesting theming attached to them. I expect them to do something cool with the zero car if you look at what they've done with Taron and Raik's front ends. What does rule 11 mean? Examination of the absolute grounds for refusal. 1. If, in accordance with Article 7 of the Regulation, the trade mark can not be registered for all or part of the goods or services applied for, the Office shall inform the applicant of the reasons for the refusal of registration. The park has not resisted after the refusal in November and this seems to me the conclusion of this trademark, so bye bye F.L.Y? Pear, Robert.W, Yoris Kerkhoff and 1 other person like this.